Hanna, known for his unerring sense of time, was at home playing with big bands and small groups. He performed with Woody Herman, Maynard Ferguson and Duke Ellington, among others. 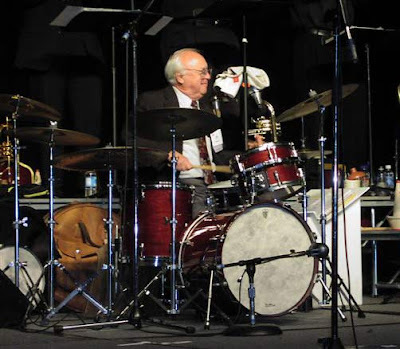 Jake Hanna, a versatile drummer who played with such jazz figures as Woody Herman and was a longtime member of the band on Merv Griffin's television show, has died. He was 78. Hanna died Friday at Kaiser Permanente West Los Angeles Medical Center of complications from a bone marrow disease, said his wife, Denisa. Hanna was equally at home playing with big bands or small groups. He performed with Herman in 1957 and the early 1960s, then joined Griffin's band, in which he played until 1975. Hanna moved to the West Coast when the show relocated from New York to Los Angeles. During his career, he also played with Maynard Ferguson, Toshiko Akiyoshi, the Marian McPartland Trio, Roberta Gambarini, Harry James, Count Basie and Duke Ellington, among others. The New Grove Dictionary of Jazz (1988) said Hanna was "highly regarded for his unerring sense of time, his ability to control a band at any tempo and his refined musical taste." He also led a group with trombonist Carl Fontana and worked regularly with the group Supersax. John Edwin Hanna was born April 4, 1931, in Dorchester, Mass. He started playing drums as a teenager. "My father played all the early records. Benny Goodman, when Gene [Krupa] was with the band. It was easy for me," he told the Sacramento Bee in 2002. Hanna served in the Air Force from 1951 to 1953. In 1977, he met his future wife while he was playing in a quartet accompanying Bing Crosby. Besides his wife, whom he married in 1984, Hanna is survived by his sisters, Mary Howard and Eleanor Judge. John Hanna was born 4 April 1931, Roxbury, Massachusetts, USA. Jake died February 12, 2010 from complications of a blood disease. He began playing drums in a marching band at the age of five in Dorchester, Massachusetts. In his youth he played in and around the Boston area, a territory where many fine jazz musician were to be found. During the late '40s and early '50s he played in bands led by Tommy Reed and Ted Weems; in the late '50s h worked with pianists Marion McPartland and Toshiko Akiyoshi, and in the big bands of Maynard Ferguson and Woody Herman. He rejoined Herman in 1962, staying for two years in the band. Otherwise flitted briefly through the bands of Duke Ellington, Harry James and Boston-based teacher and rehearsal band pioneer Herb Pomeroy. What Hanna has described as the best time in his life came when he played with George Wein's band at the impresario's Storyville Club in Boston. In the band were Buck Clayton, Bud Freeman, Pee Wee Russell and Vic Dickenson with Jimmy Rushing on vocals. In 1964 Hanna became a member of the studio band for the Merv Griffin television show, the based in New York. When the show moved to California, Hanna was one of several musicians who were given the opportunity of moving with it, provided they made their minds up fast. Along with Bill Berry, Richie Kamuca and others, Hanna made the snap decision and ever since has been located on the west coast, even though the Griffin job ended in 1975. Since then he has worked with numerous bands, including Supersax, Count Basie, Herman, Berry, and co-led an occasional small group with Carl Fontana. Although highly skilled in all aspects of his work, Hanna is one of the most self-effacing drummers in jazz, happy to urge a band along with subtilety and discret dynamics. Any band with which he played is guaranteed to swing and to have a goo time because, apart from his superb musicianship, Hanna was also a witty and gifted raconteur.